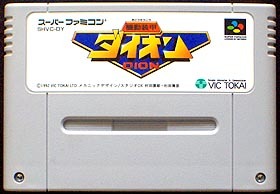 Kidō Sōkō Dion is a vertical shooter by Vic Tokai. In the year 2027, machines have conquered the world of humans. But more than a millennium later, a group of enslaved robots decide to revolt against their new masters and put all their efforts together to build a special fighting suit. However, only a human can wear and control the power-suit. We must admit that Kidō Sōkō Dion story line is very unusual. The player takes control of this humanoid-suit and flies through enemy forces. One of the originality of the game is to use a weapon system based on experience points - Each defeated enemy gives the suit experience points, in a way similar to a role playing game. A counter at the top of the screen displays how many points are needed before the current weapon can be upgraded to the next level. However, weapons instantly lose their current upgrade as soon as the ship gets hit. The game also offers four different weapons that can be switched at any time during the game : Vulcan Gun, Homing Lasers, Green forward beam-laser and Blue side-way gun. Kidō Sōkō Dion features six varied and usually long areas, with a middle-stage and an even tougher end of stage boss. On a distant planet where human life dissapeared a millenium ago, the only inhabitants are a martial society of ultra high-tech robots and the enslaved class of mechanized creatures whose fate it is now to serve their "masters". Meawhile, an underground movement of some of the best minds among the enslaved robots has developed a suit of body armor that may lead the way to vistory over the master robots, however, only a HUMAN can wear the suit... Don this suit of armour earthling -- If you dare !! The Super Famicom system, unlike the PC Engine, wasn't blessed by the shooter gods. This is why any shooter, even more when they have so many qualities such as Kidō Sōkō Dion, deserve to be mentioned. 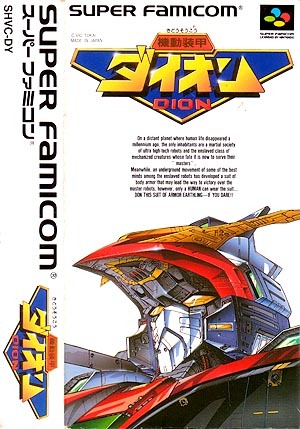 This obscure and little known title was an amazing surprise and reminds me of Compile's line of shooters with their intense waves of enemy ships and bullets flying all over the screen. The experience based weapon system works surprisingly well and gives the player some freedom. No need to collect power-ups anymore! Levels are simply huge and get you to fly across many locations. However, be warned that the game is very difficult and gets you to start from the beginning of each area when killed, which is a real pain. Yet, I recommend this game to any shooter-holics out there.